California Chrome may not have been able to pull off the Triple Crown, but that doesn’t mean that the world of equestrian events has come to a stop. We’re happy to inform everyone that our good friend Juliet Harrison, previously highlighted here, has been given the cover of the June edition of Equestrio Arabia, complete with photos from her Vertigo series and an interview. Furthermore, the same features will appear in Equestrio China. 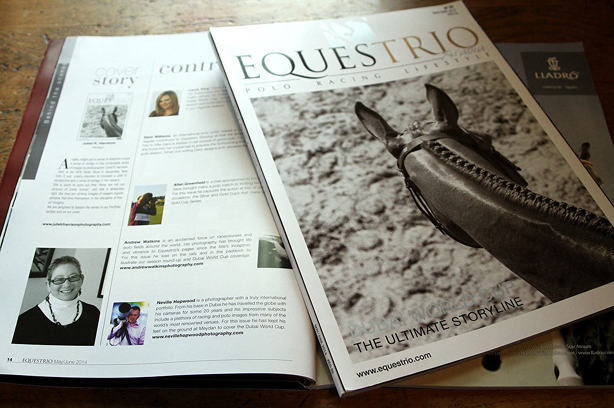 EQUESTRIO changed the face of equestrian publishing when it launched in Switzerland in 2003 and set new standards for the genre in terms of quality and content. By showcasing and celebrating the lifestyles surrounding equestrianism in all its forms, while at the same time providing expert and informed editorial illustrated with the finest photography, the title won instant appeal, both at home and abroad. EQUESTRIO Arabia became the second title in the series when it launched in Dubai. EQUESTRIO Francefollowed in 2006 with EQUESTRIO China and EQUESTRIO Italy taking up the reins in 2008. EQUESTRIO America appeared in early 2013 and completes the collection. Now published in six countries, in five languages, on three continents, EQUESTRIO is to be found at the heart of equestrian communities worldwide. A delicious melange of informed sporting editorial, fine art, luxury travel and lifestyle features. Thank you so much for your continued support of me and my work. I appreciate it very much. All my best to you and hope that they gallery is doing well.